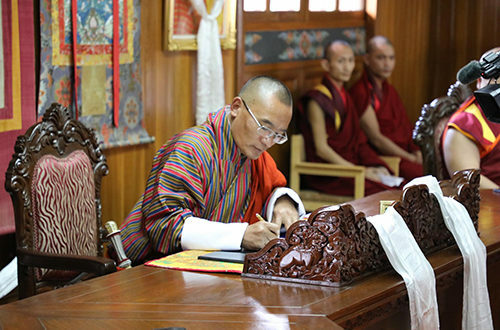 Following the Royal Kasho appointing the members of the Interim Government, Dasho Tshering Tobgay, Prime Minister and Minister signed the handing-taking of the office with the Cabinet Secretary and Secretaries of the respective Ministries. 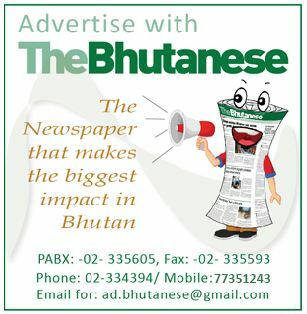 At the Tashichhodzong, the Prime Minister and Ministers offered Choemay and nyen-dhar at Dukhang and Kuenra. The Prime Minister then signed the Government Order Relinquishing the Office at the Lhengye Zhuntsho Meeting Hall in the presence of Ven. Tsulag Lopen, Cabinet Secretary, Government Secretaries and Attorney General. After the offering of Gyalpoi Zhabten and Tashi Moenlam, the Prime Minister and Ministers were escorted to their respective residences by the officials of the Cabinet Secretariat and Ministries respectively.